What happens when you take your obsession on holidays? A holiday to far north Queensland with my dear friends, Pauline and Ron, took me away from my book. The trip had been pre-planned for months and somehow I had to wrench myself from the computer. Like a newborn child I couldn’t leave it, so I took my writing with me. The day before we left, we found out that a category 5 cyclone was bearing down on Cooktown, some 650 kilometres away from our destination, Townsville. When we arrived it was calm and sunny in Townsville. 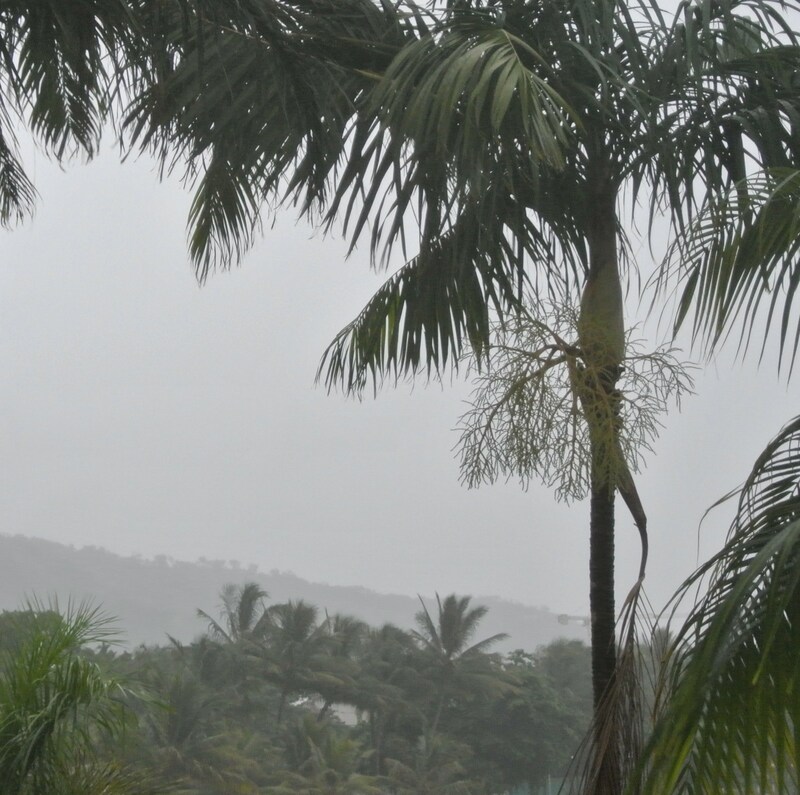 The cyclone hit Cooktown and was downgraded to category 4 – nothing for us to worry about. The next day it began to rain. We watched the weather forecast closely – the cyclone was making its way down the coast straight toward us. Should we now be worried? The next morning I woke and all seemed calm in our solidly built apartment overlooking the sea. I got up and opened the curtains – the wind and rain was fierce. The palm trees were being buffeted from side to side; the waves from the sea splashed over the pool. Pauline stood next to me – we looked at each other in alarm. Is this what a cyclone is like? The loudspeaker crackled on and a man with a deep voice announced, “Good morning, the lifts are closed until the cyclone has passed. Please stay indoors. We apologise for any inconvenience.” Our plans for the day had been thwarted – what should we do? With my obsession never far away, my thoughts went to my book. I could use the imagery of the cyclone but what else? Could my friends re-enact the murder? After a little persuasion, they agreed to humour me. The scene was re-enacted – laughter included. I wasn’t expecting an academy award winning performance, but they did a great job to help me visualise how the murder might have happened. But it created more questions. I wondered why the woman hadn’t run out of the house while her husband was being stabbed. She had picked up the phone instead. Soon after, the sky cleared. We looked out of the window – people were on the beach, children were in the pool. The cyclone had passed. This entry was posted in Writing and tagged blogging, cyclone, holiday, novel writing idea, obsession, writing on July 2, 2015 by S.C. Karakaltsas.